In the first meeting with the University of San Diego, in March 1990, John DeRicco got hit in the face with the ball sliding into second. The impact broke his nose and check, he lost a month, according to The Los Angeles Times. Back in action against San Diego by May, the University of Nevada-Reno's DeRicco lost two more games. This time, though, it was for a brawl, a particularly bad one that cleared the benches and even involved some spectators, according to The Times. The brawl was sparked by a hard DeRicco tag - on the same player whose throw caused DeRicco's injury two months earlier, then a collision on a subsequent throw. DeRicco picked up a two-game suspension as a result. Despite his time off that year, DeRicco still caught enough attention to be drafted in the 25th round by the Cubs. DeRicco didn't get much time in the pros, though. His career lasted just a single season, 63 games. At Nevada-Reno, DeRicco played well enough to find a home in the school's record book, where he remains today. He knocked 21 doubles in 1989, still good for ninth all time. He also walked 44 times that season, tied for fifth and ninth in slugging. DeRicco is also tied for seventh in career walks. 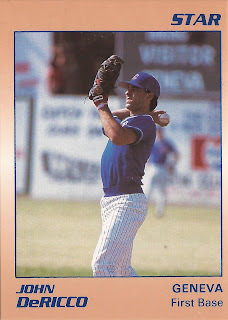 In 1989, DeRicco also won first team all-conference honors. By late April of that year, DeRicco led the team with a .377 average and 60 hits, according to The Times. After his selection by Cubs in 1990, DeRicco quickly signed. Sent to short-season Geneva, DeRicco got into those 63 games. The first baseman hit .240, with three home runs and 27 RBIs. It was his only season as a pro, his career ending with the season's end.